Department of Science and Technology Education, University of Jos. This study investigated the effects of teachers’ experience and qualifications on perceived difficult concepts in biology practicals in secondary schools in Plateau State, Nigeria. Three hundred and forty two (342) secondary schools biology teachers in Plateau State were involved in the study using researcher-designed questionnaires tagged “Biology Teachers’ Questionnaire (BTQ)” to collect relevant data. Six research questions were answered while two research hypotheses were tested. The findings of the study showed that the various concepts in biology practicals perceived as difficult by secondary school biology teachers in Plateau State irrespective of their experience and qualifications are related to drawing, dissecting, magnification, labeling, experiments and field work. The biology practicals concepts and skills with minimal difficulty are those related to staining techniques, specimen view, Models and Charts, observation and classification. The study also revealed that there is a significant difference between the experienced and less experienced biology teachers in secondary schools in Plateau State in the perceived difficult concepts in biology practicals. This is in favour of the experienced teachers. There is a significant difference between the qualified and unqualified biology teacher in secondary schools in Plateau State in the perceived difficult concepts in biology practicals. This is in favour of the qualified teachers. The recommendations deriving from the study are that biology teachers should be made to embark on in-service training, periodic workshops, seminars and conferences. The less experienced teachers should be made to learn under the experienced ones. Plateau State Government and school Proprietors should endeavors to employ only qualified biology teachers. This study determined relationship between library information resource utilization and senior secondary school students’ academic performance in Yobe State, Nigeria. The objectives of the study were to investigate the availability of science and art/humanity information resources, determine relationship between science information resources utilization and students’ academic performance, determine relationship between art/humanity information resources utilization and students’ academic performance, determine relationship between library information resources utilization and senior secondary school students’ academic performance. The study answered two research questions and three null hypotheses. The researchers adopted correlation design. The sample size comprised 597 students randomly selected from 11,932 students representing 5%. Three instruments were used in the study: Checklist was used to determine the availability of science and art/humanity information resources, Questionnaire was used to determine the science and art/humanity information resources utilization and proforma was used to determine senior secondary school students’ academic performance. Descriptive statistics of mean and standard deviation were used to determine science and art/humanity information resources utilization and senior secondary school students’ academic performance. Pearson’s Product Moment Coefficient, at 0.01 level of significance, was used to test hypotheses one and two. Multiple regression was used to test hypothesis three. The findings of the study revealed that, there was significant relationship between science information resources utilization, art/humanity information resources utilization and senior secondary school students’ academic performance in Yobe State, Nigeria. English language is an official language in Nigeria and some African countries. It is the language of commerce and industries, the language of science and technology and the language of communication among the different ethnic groups in Nigeria. As such there is need for a good understanding of the language in Nigeria for development in science and technology, commerce and industries and interaction for mutual understanding among different ethnic groups in Nigerian. 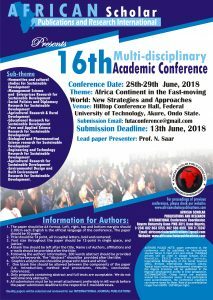 This paper aimed at enlightening the teachers of English language in Nigeria’s schools and colleges on ways in which the existing materials used in teaching and learning of English in Nigeria can be adapted to suit the needs of the learners for better understanding and usage of the language. Keywords: Materials, Adaptation, Learning, Teaching and English. The study examines problems facing written expression in French in two private secondary schools in Oyo town. Questionnaires are used to elicit responses from the respondents. Simple percentages are also used to analyze data gathered through the questionnaires from the sampled learners of French in the selected secondary schools. The study discovers that the lingua franca (English Language) interferes with French written expression. As a result of this, the paper recommends that the teacher should use methods that are capable of allowing learners to discover French structure themselves. TRANSFORMATION IN SCIENCE: THE RELEVANCE OF ASSESSMENT IN SCIENCE EDUCATION. Transformation is a process that orients an institution or organisation in a new direction or line of action that aims at improving the institution. In the history of science transformation is a practice that could be traced back to the days of the Russians precisely in the year 1957 when the first satellite was launched into the space called the SPUTNIK 1 change in education are predicated on the dynamic nature of human development. On the basis of this education sector, particularly that of Nigeria will continue to witness transformation within sub-sahara African content. Assessment in science education is a necessary ingredient for the success or otherwise of any educational development, as it is referred to as the necessary tools for transformation and improvement in our science education programme. Therefore this study outline the relevance(s) of Assessment of Science education in Nigeria and outline recommendations for the realisation of the tool, such as the development and interpretation of assessment designed both internal and external for monitoring the educational system in Nigeria should comprise an active participation of teachers at each level of science education. School of Education, Department of Curriculum and Instructions, Federal College Of Education, Zaria. The study was carried out in two higher institutions of learning in Jigawa state Dutse, Nigeria. They were purposely selected because, at the time of the study was carried out. They were the only higher institutions in Jigawa state Dutse with e- learning program. A sample of 150 academic was randomly selected to participate in the study. Putting into consideration that many factors affects e-learning the current study explored only three psycho- social factors. Specifically, the study was carried out to answer the question, what is the relationship between academic staffs level of emotional regulation and their adoption of electronic learning or instruction in higher institutions in Jigawa State Dutse. Nigeria? A cross-sectional co relational survey design was used, taking a quantitative approach. The data were analyzed using person’s linear correction co-efficient. The findings were that the relationship between academic staffs level of emotional regulation and their adoption of electronic learning or instruction in higher institutions in Jigawa state Dutse, Nigeria was significant (sig. 0.003). It was concluded that whereas many factors affect the adoption of e-learning in the context of Jigawa state Duste in Nigeria, the high level of emotional regulation of the academic in higher educational institutions in Jigawa state Dutse, has contributed much to the academic adoption of electronic learning or instruction in their respective institutions. Keywords: Academic staff, Emotional Regulation, Electronic learning, Higher Institutions. *OKEMAKINDE, T. * OLORODE, OKUNADE ADELAYO & ** OGUNWUYI, O. This work examined the administration of Colleges of Education in Nigeria for better development. There is a believe that the system is responsible for the development and production of good quality manpower within the context of our society but which is characterized by multi-faceted problem bedeviling the system in Nigeria such as financial crisis, deteriorated and dilapidated infrastructure, brain drain, graduate unemployment, political interference, secret cult and erosion of college autonomy. It was then concluded that before meaningful achievement can be realized in the administration of colleges of education, the government must be ready to take some vital responsibilities such as adequate funding of the school, improvement on the infrastructure restricting the role of college of education depoliticisation of the college system eradicating of secret cult and granting of autonomy to colleges of education in Nigeria. THE CAUSES AND EFFECTS OF TEACHERS STRIKE ON STUDENTS ACADEMIC ACHIEVEMENTS IN BUSINESS STUDIES AT JUNIOR SECONDARY SCHOOL IN YAMALTU-DEBA LOCAL GOVERNMENT AREA OF GOMBE STATE. *Department of Business Education, Bauchi Institute for Arabic and Islamic Studies, Bauchi, Bauchi State. **Department of Vocational & Technical Education, Abubakar Tatari Ali Polytechnic, Bauchi, Bauchi State. Secondary school education is a form of education that is given to children specifically after the primary school education in order to prepare them for higher level education. Because of the insufficiency of the education given at the primary level, secondary education provides more literacy and communication skills better than primary school education. Secondary school education in its broader sense is divided into two main categories that is, the senior and the junior secondary school. Junior secondary schools consist of the first three years of secondary studies and the curriculum at this stage is pre-vocational in nature. Subject like English language, Mathematics, Basic science, Basic technology, Business studies, Computer studies, Health and physical education, Religious studies, One of these three Nigerian Languages, Arabic language among others. Upon completing the JSS 3, students are expected to write the Junior School Certificate Examination, an examination which is normally prepared by the ministries of education. This will therefore enable the child proceed for the second three year of his secondary education. After proceedings to the next three year of the child secondary education, this level prepare the child widen his skills, experiences, and knowledge to be able to face further challenges. Students here have option of offering at least seven or at most nine subject including the main core subject English and Mathematics. The students will at this stage begin selecting subjects that will gives them their areas of specialisations from Chemistry, Physics, Government, History, Geography, Commerce, Accounting, Biology, Agric science etc. At the end of the period, students are expected to sits for ‘WAEC or NECO’ West African Examination Council or National Examination Council or equivalent for the five O’level credit that will enable them get admission into the Universities and other tertiary institutions of learning. Effort by Public employees to joined labour unions began as early as (1820s). Through the unions, employees could be able to make strong impacts and changes in their various places of work. Union serves as links that brought employees together, and help their better conditions of services. State and local government recorded some success through the activities brought about by unions while Federal government’s employees have very few results. Most of the federal employees like artisan and craft men were employees by the war and navy department, military officers that are not affected by public opinion oversaw these federal employees, the workers were forced to resort to making use of strikes. The United States federation of labour begins in (1990) founded the first National union for state and Local Government employees the union was called American Federation of state, country and municipal employees. Government employees of all types joined the organization that comprises of workers in many places of work. Teachers, firemen, police officers etc were the first to be involved. The National Association of resident Doctors issued a twenty eight (28) day ultimatum to the federal government for the implementation of the agreement reached between them, which lead to the suspension of their three moths strike or else they embark on national strike. Keywords: Teachers strike, secondary education, students achievements, schools. Department of Electrical/Electronics, School of Technical Education, Federal College of Education (Technical) Bichi, Kano State. This paper examined the prospects and the challenges of Information and Communication Technology (ICT) in the Nigerian Educational System. It highlights the possible areas information and communication technology can contribute towards functional educational system. The use of electronic devices has enhanced the process of teaching test examination, administration, scoring of scripts and recording of marks as well as dichotomizing question papers to reduce examination malpractices. The challenges are attributed to many factors among which are inadequate fund in the educational system, irregular power supply, poor network provider, inadequate qualified programmers, poverty, few software engineers and technicians and lack of skills on the use of information and communication among teachers. This paper recommends establishment of a formal ICT centers with trained and or specialized staff in all the local government areas across the country. State and local governments should appropriate special fund for ICT development in schools and colleges. Keywords: Trends, Information, Prospects, Challenges, Educational. Teaching is a dynamic profession and professional teachers need to ensure they employ suitable methodology in the classroom for effective teaching and learning. Literature shows that activity-based method is a catalyst for effective learning- a method in which the child is actively involved both mentally and physically. This paper brings into focus some selected strategies for activity-based method, the steps required for effective organization of activity-based lesson activities, the role of the teacher in an activity based lesson and the sample of activity-based lesson plan on primary mathematics were presented. One of the advantages of the method is that, it promotes better understanding of lesson among students as they learn by practicing the tasks themselves. The paper also argued that activity-based teaching method cannot be used on a regular and daily basis as it involves lengthy procedure and less meritorious students might not prepare for a task which might lead to failure of the whole process.